A pedestrian-friendly Poplar Avenue may seem like an oxymoron — or even an impossibility — but it won’t be if a new business group has its way. Boyle Investment Co., Highwoods Properties Inc. and Loeb Properties Inc., which each own property along the Poplar Corridor, have teamed up to form the Shady Grove/Ridgeway Business Owners Association (BOA). The group’s mission is to make the area more walkable and aesthetically pleasing. 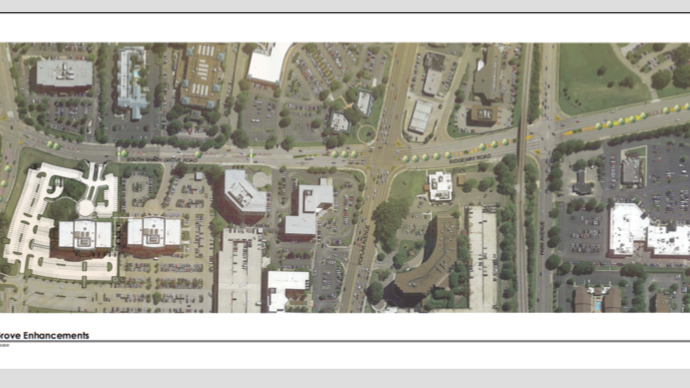 The first task for the Shady Grove/Ridgeway BOA will be to create a walkable route from Briarcrest Avenue across Poplar to the Park Place Center at Ridgeway Road and Park Avenue. Boyle is currently in the process of constructing a new 155,000-square-foot building at 949 S. Shady Grove Road, which will be anchored by Pinnacle Financial Partners’ (Nasdaq: PNFP) Memphis headquarters. That development is at the corner of Briarcrest Avenue. In addition to streetscape upgrades and connectivity, the goals of the BOA are to ensure the Shady Grove/Ridgeway area remains well-maintained; that it has a cohesive brand and identity; and to provide district property owners with a way to discuss matters affecting their properties, according to Binkley. In a release, the BOA said it is working with Memphis Mayor Jim Strickland, County Commissioner Heidi Shafer and City Councilman Kemp Conrad on the plans. Binkley said it is too early in the design process to determine estimated costs or a timeframe. The source of the funding is still being determined. “We are hopeful that it would be a mix of private and public funding,” Binkley said. Steve Guinn, Memphis division vice president for Highwoods, said they still have not met with the City of Memphis to determine if any funding is available, but Highwoods is willing to invest in upgrades to the district.